Ever since I was a little girl, I was always fascinated with sarees. I always took my mom's sarees and wrapped it around me like I was a big shot around the house! 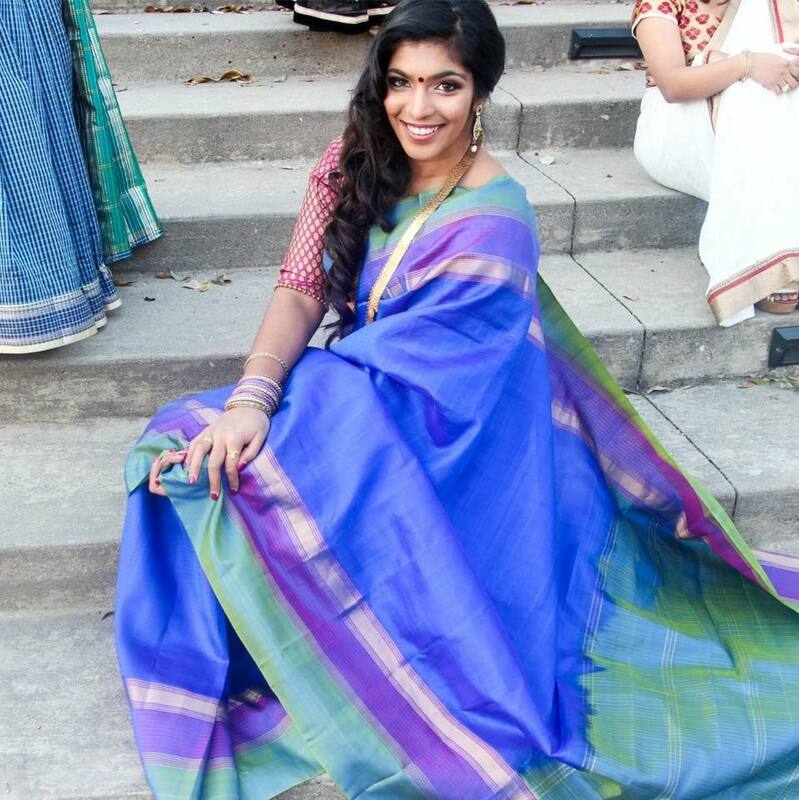 I learned how to put on my first saree in the 11th grade while watching my mother put one on herself. Just seeing how 9 yards of fabric can be turned into a beautiful outfit really amazed me. I loved how one saree could be worn in multiple ways, flattering all body-types. I practiced on my mom, sister, and all my church friends at our Dallas Kna Convention. I began to drape all of my friends in college for various events as well! A good friend of mine named Benita suggested that I should take this talent and turn it into a business for myself. Although the thought seemed a little scary, I went for it knowing I had the support of my family and friends. In October of 2014, I draped my first bridesmaids at a wedding. I absolutely loved playing a role in making someone's big day look perfect. Making sure each bridesmaid felt beautiful, comfortable, and elegant in their sarees gave me such a great sense of fulfillment. Ever since that first wedding in 2014, I have been draping for individuals, events, weddings, etc. As of right now, my record stands at draping 34 people in 48 hours! I am so thankful for all of the constant support my clients have given me. This small draping business has taken off in ways I can't begin to imagine, and I love every minute of making each client feel their absolute best in their saree! When I'm not draping, I work as a Montessori Teacher in Garland ISD. I absolutely love what I do and working with kids brings me so much joy. I'm also about to pursue my master's degree in Health Administration in the Spring of 2017!